As more and more of our lives are lived online—both on the Web and through smarter technology throughout the home—our personal information has become more vulnerable to thieves. Help protect your identity by following these three safety measures. Once upon a time, the only type of theft a person had to worry about was the old-fashioned kind, in which someone might physically break into a house and steal material possessions that aren’t theirs to take. But as life has become increasingly dependent on the digital realm, and every company, service, and product pushes you to connect via a new app, threats of identity theft and online fraud have risen exponentially, changing the ways in which we keep our lives and resources safer. You might have a state of the art home security system, but your identity needs protection, too. Luckily, although thieves today may be more tech-savvy than ever before, so are the tools we can use to help protect our assets. Read on to learn three key tips for being smart about security in a digitally insecure age. 1. Keep your machines clean. A 2015 survey conducted by the National Cyber Security Alliance and ESET, an antivirus software developer, reports that one in five Americans already uses a mobile device to access at least one device in the home—say, a thermostat, cable box, or lighting system—remotely. Moreover, nearly every household these days is connected to the Internet, probably through its own Wi-Fi network. We’ve entered the age of the Internet of Things, when a growing network of physical objects—from phones and watches to home security systems and cars—is embedded with technology that enables these objects to connect and exchange data with one another and with us. So, it’s important to take control of that data and the things that collect it. 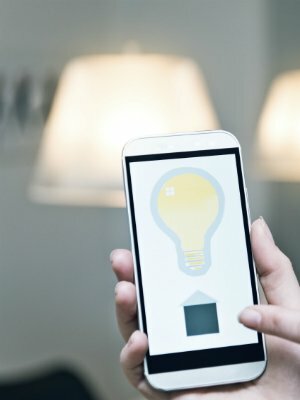 If you’re using devices and apps to control your home’s temperature, security, lighting, or television recordings, start by programming those apps with strong passwords, then keep your login information (both usernames and passwords) close to the vest and your router secure at all times. It’s also crucial to keep your software up to date. “Updating the software, apps, and operating systems you use in a timely manner will help ensure that the latest security issues will have been addressed,” says Paige Hanson, chief of identity education at LifeLock, a leading identity theft protection company. In other words, the fact that you bought or downloaded something and gave it a password isn’t enough on its own; indeed, the more technology you use, the more vulnerable you are. By making sure you’re not falling behind the times, you can see that you aren’t leaving yourself open to security breaches. Hackers work around the clock to steal your information, so diligence is key. 2. Pay attention to what you’re sharing (and who you’re sharing it with). In this era of social media, online banking, and constant connectivity, it’s still easy to forget the full reach of the Internet. When you post a photo to Facebook, you may think you’re simply sharing it with a few dozen or hundred acquaintances, but you may in fact be sharing it with anyone and everyone who happens to click on your profile—identity thieves included. The same goes for listing your phone number, home address, and other sensitive information on networking sites that feel personal but are often very public. Privacy settings on social media channels are a constantly moving target, so it’s essential to check all your profiles on a regular basis to ensure that your audience is as limited as you’d like it to be, and that if something changes, you’re sharing only information you’re comfortable having out there. Set a monthly (or even more frequent) calendar appointment with yourself to run such a quick security check. Pay particular attention to your smart devices, many of which collect more data than you may realize. Take time to read up on each device and understand how your information is being stored and used. Can it be sold to third parties? What happens if you decide to discontinue its use? Knowledge is power when you’re deciding how and where to allow your data to be shared, so do your homework by reading the fine print and diving into user reviews before committing to a new technology that might not have your best interests in mind. 3. Invest in an identity theft prevention system. If you really want to ensure that your assets—from your name and social security number to the very last penny on your credit card balance—have protection, it may be wise to explore subscribing to an identity theft protection service like LifeLock. While no one can prevent identity theft or monitor all transactions at all businesses, LifeLock provides a wide range of services, from proactive identity alerts and threat detection to remediation services. The company leverages an intricate theft prevention system based on unique data, science, and patented technology to offer protection that goes beyond the scope of simpler services like basic credit monitoring. “At the core, our products help monitor identity-related incidents, alert members to suspicious activity that is detected within our network, and address ID theft-related issues on behalf of victims,” Hanson says. “In the event that identity theft occurs, LifeLock provides an award-winning member service team,” she continues, including any necessary lawyers, investigators, and accountants, all funded up to $1 million as part of the company’s $1 Million Service Guarantee. And, depending on your level of membership, you can replace anywhere from $25,000 to $1 million in stolen funds unable to be recovered. Investing in any level of the services offered by LifeLock sooner rather than later is a smart move, especially if you plan to use more technological devices in your home—and, thus, share more of your personal information—in the future. As smart homes become the norm rather than the exception, it’s wise to set a system in place that captures and monitors everything you add, the moment you add it, from here on out. The old saying “an ounce of prevention is worth a pound of cure” certainly applies here. Rather than disease agents you’re trying to keep at bay, however, we’re talking about equipping yourself against high-tech thieves who are determined to take what you’ve earned. By entrusting an expert to stay two steps ahead of them on your behalf, you’re free to devote your time and energy to the people and activities you enjoy—all the while confident that your home’s technology, your assets, and your identity are being diligently protected.